These soft and fluffy Hawaiian sweet rolls are perfect for ham sliders, sandwiches, and appetizers. The dough is flavored with brown sugar and pineapple juice for a touch of sweetness. 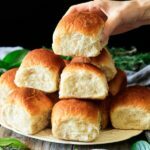 You don’t need a bread machine to make these homemade rolls for dinner! Pour the milk, butter, and lard into a small saucepan and set over medium heat until the fats have melted, stirring occasionally. Remove from heat and let cool to 115 F.
Dump the flour into the bowl of a stand mixer and add the yeast and salt on opposite sides of the bowl, stirring each one in with your finger. Add the sugar, eggs, and pineapple juice and mix on low speed with the paddle attachment until blended. The dough will be very dry. Trickle in all of the milk and fat mixture while the mixer is running on low speed. Turn up the speed to medium and mix until a sticky dough forms. Turn off the mixer and let the dough rest for 10 minutes. Switch attachments to the dough hook and knead on medium-low speed. The dough should clean the bowl, but it will still stick to the sides. If the dough refuses to clean the bowl after a few minutes of kneading, add more flour (just a spoonful at a time) until the dough cooperates. Make sure the dough passes the windowpane test. Check this by breaking off a lump of dough and stretching it between the thumb and forefinger of each hand. The dough should be translucent without tearing; if not, knead a minute longer and check again. Shape the dough into a ball, place in a buttered bowl, and cover tightly with plastic wrap. Let the dough rise in a warm place until doubled in size, about 1 1/2 to 2 hours. Turn out the dough onto a lightly floured surface and punch it down all over to knock out the extra air. Divide it into 12 equal pieces, using a kitchen scale for accuracy, then roll each piece into a tight ball. Place the balls equally apart in a buttered 9×13-inch pan, then cover them with a clean garbage bag or buttered plastic wrap. Let the rolls rise in a warm place until they have doubled in size and are springy to the touch, about 45 minutes to 1 hour. Preheat the oven to 375 F about 10 minutes before the rolls are done rising. Bake the rolls at 375 F for 20 minutes, until they have an internal temperature of 190 F on a meat thermometer. Let the rolls cool in the pan for 5 minutes, then remove them from the pan and let them cool completely on a wire rack.